Neural prostheses look promising in new studies, though there's still a lot of work to do. How far would you go to keep your mind from failing? Would you go so far as to let a doctor drill a hole in your skull and stick a microchip in your brain? It’s not an idle question. In recent years neuroscientists have made major advances in cracking the code of memory, figuring out exactly how the human brain stores information and learning to reverse-engineer the process. Now they’ve reached the stage where they’re starting to put all of that theory into practice. Last month two research teams reported success at using electrical signals, carried into the brain via implanted wires, to boost memory in small groups of test patients. “It’s a major milestone in demonstrating the ability to restore memory function in humans,” says Dr. Robert Hampson, a neuroscientist at Wake Forest School of Medicine and the leader of one of the teams. The research is funded by the Defense Advanced Research Projects Agency, which sees brain implants as a life-changing technology for the 270,000 American soldiers who have suffered a traumatic brain injury in combat. The possible applications go much further, however. Brain implants could also change the lives of millions of Americans battling Alzheimer’s disease and other cognitive disorders, or even help stave off the mental decline that we all confront as we get older. The momentum behind today’s brain-implant breakthroughs has been building at least since 1961, when Dr. William House invented the cochlear implant as a tool for restoring hearing in people with profound deafness. At the time, many of House’s colleagues considered the idea of hacking into the auditory nerve absurd. But it worked, and more than 300,000 patients around the world now use such implants. 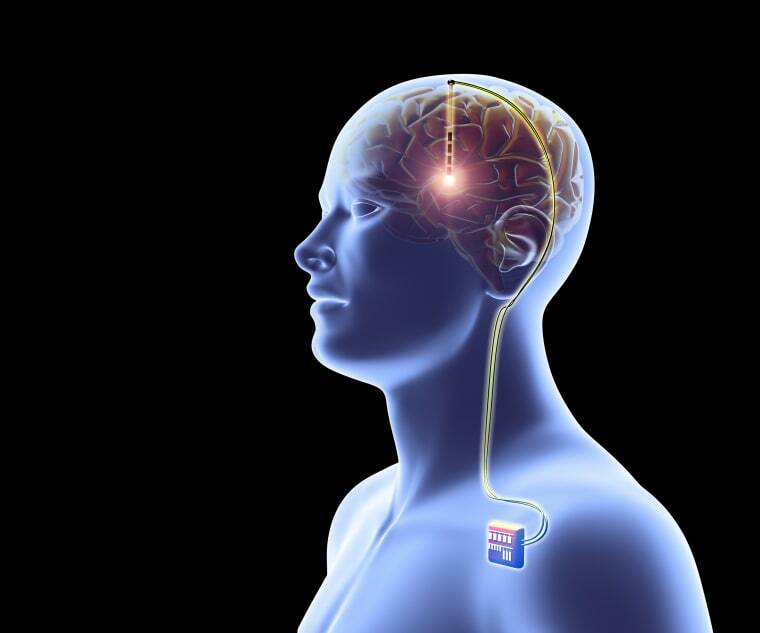 Things heated up in 2002, when the U.S. Food and Drug Administration (FDA) approved deep-brain stimulation as a treatment for Parkinson’s disease, a neurodegenerative disorder that affects an estimated 10 million people around the world. This treatment, in which a pacemaker-like device directs tiny electrical currents into the brain, has proven to be highly effective at controlling the tremors and rigidity that are a hallmark of Parkinson’s. In addition to Parkinson’s, deep brain stimulation is now being used to treat obsessive-compulsive disorder, depression, and epilepsy. “We see people improve by 40 percent or even 70 percent, which is huge,” says Dr. Heather Berlin, a cognitive scientist at the Icahn School of Medicine at Mt. Sinai, who has worked extensively with patients affected by cognitive disorders. Even by the standards of those successes, though, the latest advances in memory implants are remarkable. For the first time, researchers have shown that it’s possible not only to suppress electrical misfires in the brain but also to enhance one of the brain’s highest functions — the ability to encode new memories and later retrieve them. To sidestep ethical concerns raised by the idea of tampering with people’s brains, the Wake Forest and Penn State teams are conducting their research on people with epilepsy who were already slated to receive brain implants. Tapping into those implants, Kahana’s team read the brain signals of 25 test subjects while they performed a simple word-recall memory test. The scientists noted which brains regions were associated with poor memory encoding and then delivered tiny jolts of electricity to selectively disrupt activity in those regions, allowing other regions with correct memory response to dominate. When the subjects were later tested, their scores in memory tests jumped by an average of 15 percent. “That may not sound like much, but 15 percent is equivalent to 18 years of brain age,” Kahana says, adding that it’s like rewinding the memory of a 43-year-old to what it was like when she was 25. At Wake Forest Baptist Hospital, Hampson and his collaborators took an even more audacious approach. They manipulated the memories of 20 test subjects by reaching directly into the hippocampus, a seahorse-shaped structure deep within the brain that is commonly regarded as the seat of memory. As the subjects completed a test of short-term memory, the researchers recorded the electrical signals associated with correct answers. Then Hampson and company ran a separate experiment in which they delivered those same recorded signals into the brain. When the men and women were subsequently given memory tests, their scores rose by 35 percent. “It shows that we can apply brain stimulation in a very focused manner — to reinforce the specific codes the brain uses to form memories,” Hampson says. A great deal of work remains to be done to make sure memory prostheses work in everyday use — and that they’re safe. But already several academic groups and startups are racing to develop stimulators that can handle the brain’s big data without requiring the bulky equipment used in the Wake Forest and Penn State experiments. The goal is a system similar to a heart pacemaker, with the brain implant wired to a small, battery-powered controller surgically inserted under the skin. “We’re hoping to develop a fully implantable device and run trials with that device in the next few years,” Kahana says. By 2021, Paradromics, a San Jose-based startup, plans to sell what it calls a “cortical modem,” an implant capable of reading out brain states and stimulus signals at a rate of 1 gigabyte of data per second. If memory-enhancing implants work as expected, potential applications could go far beyond people with traumatic brain injury and Alzheimer’s, Kahana says. Eventually, the eligible patients could include those with age-related memory loss — which is to say, pretty much everyone who lives long enough.